SDH stands for Succinate De-Hydrogenase, an important enzyme and one key to the effective functioning of the mitochondria, a critical organ of the fungus. Mitochondria are responsible for energy production for the fungus. They are often referred to as the “cellular power plant” of the fungus. Being responsible for other key cellular functions such as cell growth, it can be seen that impacting the mitochondria by inhibiting the SDI enzyme will have a major and detrimental impact on the fungus. 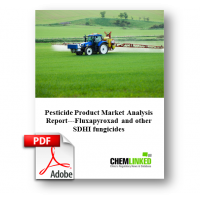 The term SDHI fungicide is used to refer to fungicides that inhibit this enzyme. Currently, there are more than 17 kinds of SDHI fungicide products in the market, including bixafe, fluopyram, penflufen, isopyrazam, sedaxane, fluxapyroxad, penthiopyrad, and benzovindiflupyr. Fluxapyroxad was developed by BASF, mainly applied on grains, soybeans, corn, vegetables, and fruits. Fluxapyroxad has been registered in USA, Australia, Canada and New Zealand with more than 2.5 billion annual sales.